Sangria and juices and tapas, oh my! I’ll be the first to tell you, 24 hours isn’t enough time to get to know ANY city. Not really. Especially a city as big and full and exciting as Barcelona. But that’s what we had, so we tried to make the best of it. We walked. Everywhere. We hoped to see as much of the city as we possibly could, and walking is the best way to do that. Our hostel was beautiful, tucked down one of many sunny, airy Barcelona streets. It was a great first hostel for this trip. They must have been overbooked because they stuck us in a room with the male hostel workers! We didn’t realize this until we saw them moving our beds out of the room before we had even left the building. Lol. The city is full of tall, stately, white buildings lined with balconies on balconies on balconies. It has a quirky vibe, too. Barcelona Arts and Culture Hostel… which we FINALLY arrived at after potentially getting a little lost. Less yum. There were also plenty of skinned animal heads. We ordered a ceaser salad and those little pepper/pancetta sandwhiches with crusty brown bread. SO GOOD, especially after not having eaten during or after our flight. Also, OLIVES. We were already full when they brought us… two whole fish? This simple sandwhich was one of my favorite foods on the whole trip. La Boqueria is the market of all markets. SO MUCH FRESH JUICE. This man was feeding pigeons… and parrots. PARROTS. We helped make a traditional dinner at the hostel. The first place we ate. A quaint little neighborhood tapas joint. That time I accidentally ordered the most American drink on the menu… I don’t even like sweet drinks topped with mountains of whipped cream at home… And there I was in Barcelona with one. We happened to be there over the time Catalonia (the area of Spain where Barcelona lies) was trying to split off from the rest of Spain. We saw signs and some graffiti referencing the referendum, but not much else (no protests or anything). We also walked down La Rambla, a beautiful tree-lined street with space on both the sides and in the center for pedestrians to walk. Two months earlier, a terrorist plowed through the pedestrian walking area in a van, killing 15 people and injuring many more. On the day we visited, nothing seemed out of the ordinary. Any day at Denver Art Museum should start at Amethyst Coffee Co.
I’m obsessed. We went around 10:30 on a Thursday. It was pretty busy, but the barista was still super helpful. I had an iced key lime caramel latte, because I’m a sucker for interesting flavor combinations. I’d recommend it, although I would have preferred a stronger key lime flavor. I also tried a vegan apple spice doughnut. Seriously. I want to spend every day here. The vibes were so good, the wifi was so strong, and the playlist was so dope (Manchester Orchestra anyone?) that I ended up coming back later in the afternoon to charge my phone, enjoy a cortado, and plan out the rest of my day. I’m a sucker for an art museum with cool architecture. If the museum itself isn’t art, I find it hard to trust that it will hold decent art. The cost is $13 for adults, with an additional $5 to see the special exhibit. I figured future chances of seeing an exhibit on Western films and the art that inspires and is inspired by westerns were slim, so I sprung for a ticket to the special exhibit, The Western: An Epic in Art and Film. The Clint Eastwood area was one of my favorite parts of the exhibit. I enjoyed the film clips spread throughout the paintings and other art. I am partial to art exhibits set up in interesting ways – not necessarily by medium or by time period, but rather, by how the pieces influenced each other (The Barnes Foundation in Philly is a great example of this). Pioneer painters and indigenous artists inspired western film directors, and those westerns in turn influenced later artists. The rest of the museum is beautiful. Each floor is a different time period/culture/movement. I confess to moving through the Spanish Colonial, Asian, and American Indian wings pretty quickly. Another collection I enjoyed was the Modern and Contemporary Art collection. This is textiles, not lazer beams. I stared for a long time. All in all, I’d recommend the Denver Museum of Art. I really liked the Modern and Contemporary section, and the museum itself was fun to explore. Bonus: this is one of the best museums I’ve ever seen for children. Every collection had fun areas for kids, including puppet shows, art projects, family patios, and rooms full of toys. I haven’t seen anything like it in any other art museum I’ve been to. Pro tip: There are lockers at the museum, so if you’re roaming around all day with a suitcase in tow (like I was), you can leave it there – just be back before the museum closes! WOAH SO COOL: If you visit the museum from Tuesday-Thursday during the summer months, be sure to check out the food truck festival in the nearby Civic Center Park. I was pleasantly surprised when I stumbled upon a large array of food trucks. Can I eat lunch here every week, please? After stumbling around in a daze for awhile, unable to decide what I wanted to try, I settled on Venezuelan food and a popsicle, and was not disappointed in the least. Arepa is the BEST. Seriously. Like a taco but… dare I say it? … better. Have you been to this museum or any other art museums in Denver? Where should I go next time? A few weeks later, it was settled. We bought our tickets and headed to the Caribbean! The water really is this clear. “Where/what is St. Croix?” you may ask. Well, you came to the right place. First, some quick St. Croix facts since I know you’re dying to know some background. -St. Croix is the largest island in the U.S. Virgin Islands. You can see the Virgin Islands hanging out down there to the right of Puerto Rico. -The island was originally settled by the Dutch. The U.S. purchased the islands of St. Croix, St. John, and St. Thomas for $25 million in 1917, but even now, some signs, menus, etc. are still printed in Dutch. -The ten dollar founding father, Alexander Hamilton, lived in St. Croix from 1765-1772 (age 8-15). He was born on the Isle of Nevis, and, thanks to some wealthy benefactors who saw his skill and intelligence, left the Caribbean to attend college on the North American mainland. 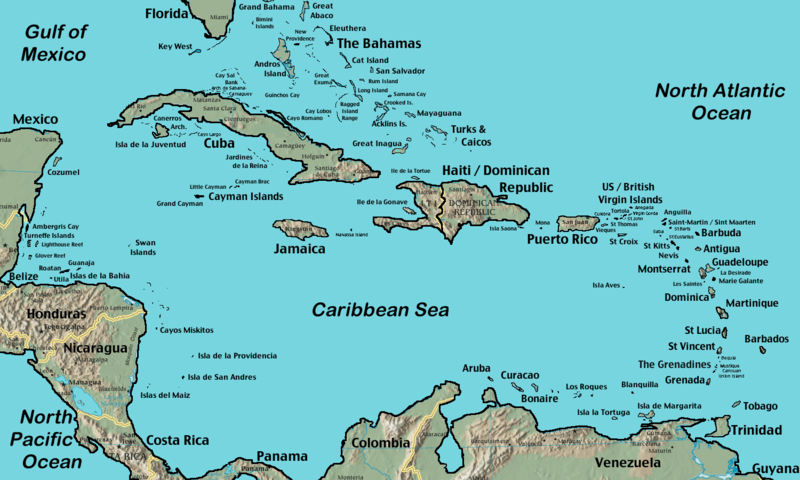 -St. Croix produces much of the rum consumed in the United States. All Captain Morgan and Cruzan rum is produced on the island. -There are two big towns/small cities/districts on St. Croix. Frederiksted (the shadier one with a red fort) and Christiansted (the more upscale one with a yellow fort). It was hot. And our ride for the week was RAD. Katey was our fearless driver. She handled driving on the left side of the road with ease. St. Croix is beautiful. Soft sand leads to the bluest water, and there are sections of dense jungle, too. The sun shone every day, but it was often partly cloudy as well, which made for some really nice beach days. I’d been to the Caribbean twice before, so I had some frame of reference as far as what to expect. It reminded me more of Grenada than Jamaica. It’s smaller than Jamaica, and not as much of a tourist destination. We stayed in a house near the YWAM base, that they have specifically for vacationers. We got connected with them thanks to my friend Katey (three of my traveling companions had stayed with them last year). As a friendly bartender named Jameson told us, “It’s good to have friends in St. Croix.” Couldn’t agree more, Jameson. Vanessa, who helped us get settled into the house, told us there’d been some strange things happening on the island, and recently a girl was rear-ended at night, and “taken” (dun dun DUHHHHHH). Sooooo… she recommended that we try to get back to the house each night by 8. I think we got back to the house by 9 that night, and more or less ignored the warning for the rest of the trip. Oops. Sorry Vanessa. And our moms. We arrived in the afternoon, so we pulled on our swimsuits, slathered on the sunscreen, and headed straight to the beach. Rainbow Beach is near Frederiksted, and on our way there, we passed a little beach restaurant called Rhythms, where we were hoping to eat. That afternoon was honestly the only time all week that I felt uncomfortable/unsafe. Besides the groups of smoking, drinking, staring men on the side of the road, the people in St. Croix were friendly and helpful. One day, the Jeep got stuck in some sand (note to self: don’t park in deep sand), and the very first vehicle to pass by came back and pulled us out. And everyone had recommendations of out-of-the-way things for us to do and see. Rather than giving you a day-by-day play-by-play of the trip, I’ll just tell you about some of my favorite things. We heard tell of an “easy” hike to some tide pools in the jungle behind Carambola. So on Tuesday morning we headed out. It only took us about an hour to reach the tide pools, but it was a more difficult hike than we expected. On the way, we saw some interesting birds, hermit crabs, and most important of all, VIEWS. View from Carambola, one of our favorite beaches. The Tide Pool hike led us over the side of those mountains. The tide pools were beautiful and warm, and getting to them proved to be a bit treacherous. But we ignored the “stay off rocks” signs, and made it out. Of course I was too busy swimming in them and playing with the black sand to take any actual pictures of the pools themselves… So here’s a few taken by my friends. We spent an hour in the tide pools, and then hiked back through the jungle to Carambola, where we lay on beach chairs for the rest of the day! Views along the hike… That sandy beach in the distance is Carambola. Wednesday night, we went to Salt River Bay (the place Christopher Columbus landed in St. Croix) to join up with a see-through kayak tour of a bioluminescent bay. We kayaked out of Salt River Bay and through open ocean, past the masts from a shipwreck (!!!!) to arrive at the bioluminescent bay. We were led by our fearless guides, Michelle and Michelle (for real). I can’t explain to you how awesome the bio bay was. Nor can I go into detail about what exactly causes the bioluminescence (bacteria that glows, or something like that). Nor can I show you photos of the night, since we were not allowed to take our phones or cameras. But I can tell you I’ll never forget it. I can tell you it was one of the most incredible, most terrifying, most other-worldly experiences I’ve ever had. Imagine looking through the bottom of your kayak to see galaxies streaming by. Imagine hitting the water with your hand or oar, and seeing sparks shoot outward into the water, swirling and whirling around. It. Is. Magical. Google it. And if you EVER get the chance to kayak in one of the seven bioluminescent bays in the world, DO IT. Do it. Do it. One day we went to a resort called Tamarind Reef. This is where we met Jameson, who gave us plenty of tips. We saw a bunch of iguanas there. They were big, seemed to enjoy lying in the sun as much as I do, and moved surprisingly fast. My friends ended up leaving, so I had most of the day to myself. My introverted side flourishes in these moments, and I planned to just lay on a beach chair reading until they returned. But free afternoons rarely go as planned, and I ended up adding a little adventure to my day. I ended up taking a kayak out to an uninhabited island about a mile away. While there, I ran into a friendly Asian couple who had swam out (WOAH). They had snorkel gear, and told me they’d seen sea turtles. They let me borrow a snorkel mask and pointed me to the place they’d seen the two turtles. I came within about 4 or 5 feet of them! It was awesome. I hiked around the island a bit, despite a sign that warned NOT to leave the beach because it was a wildlife preserve. I ended up getting stung by a bunch of tiny ants (apparently that’s the wildlife they’re preserving). I still have the bites on my hand a week later; if I die suddenly, those ants could be the cause. Thanks to the sweet Asian couple who took this picture, shared their water with me, and lent me their snorkeling gear. Yay humanity!! ALMOST back to safety, I felt safe enough to get my phone out of the waterproof pouch and take a few pictures from the sea. On the ride back, I felt like there were definitely a few unexplained bumps against the bottom of my kayak, so I rowed faster and faster! The sharks didn’t get me this time (probably because they were in my imagination), but it might be awhile until I go ocean kayaking again. We preferred Christiansted to Frederiksted. We spent a little time shopping, walking along the marina, exploring the fort, and EATING. We didn’t see iguanas until the last two days, and then we saw so many! Point Udall – The Easternmost Point in the U.S.
We rose at 4-something one morning to watch the sunrise here. It was a beautiful drive and the views were good on the way back, but unfortunately there wasn’t much of a sunrise. I hiked down toward the water but gave up because my flip-flops couldn’t handle the thorns and steep rocks. One cool thing about Point Udall? It’s the easternmost point in the U.S. This means I’ve been at the Westernmost point in the U.S. (South Point, where I cliff jumped in Hawaii), and the Easternmost point in the U.S. this year! St. Croix’s biggest export? Rum. We toured the oldest distillery on the island, and let’s just say it was the most entertaining tour I’ve been on since… well, ever. Most interesting fact I heard: They transport the rum in tanks marked “ethanol” so they won’t be hijacked on the road! Ironically, Rhythms, the beach-side joint that looked over-crowded and a little scary the first night, ended up being my favorite restaurant. The food was amazing and it was a nice, relaxed place. I’m glad we gave it a second chance. Raspberry mojito, Painkiller, Red Stripe. Yum. Everything in St. Croix runs on island time, so if a restaurant opens 15 or 20 minutes later than it’s supposed to, it’s no big deal (everyting is irie, mon). Cats and roosters happily wondered in and out of restaurants; one outdoor restaurant even had toy guns for customers to scare off territorial roosters. Christine’s is the cutest little French cafe! This food was SO GOOD. What you can’t see here is the cats and chickens that bothered/befriended us all through the meal. The bathroom at Christine’s. Uh, quaint? La Reine Chicken Shack is a popular local place. They only have a certain amount of chicken each day, and when they’re out, they’re out. If you’re ever on the island, be sure to stop here for Johnny cakes, chicken, and rice. Actual bar at the end of the world. This kombucha, cold brew, and bush tea man was another hit. The last day he had passion fruit milk kefir, which sounds weird, but is delicious. Out in the middle of the St. Croix jungle, there are some pigs. “What do these pigs drink?” You may ask. Beer. They drink beer. It is hilarious and strange and definitely made for tourists. The hilarious (stereotypical Cruzan) bartender told us it all started years ago when a patron at the bar set his beer on the ground, and a pig named Buddy wondered over, tipped it, and drank. From then on, that man would buy Buddy the Pig a beer every time he came to the bar. These days, the pigs drink O’Doul’s, because pigs who drink fully alcoholic beer pass out by noon (and, you know, animal rights… PETA… all that jazz). So uh, I added “Feed a pig a beer” to my bucket list, then checked it off. We found an old plantation on a tip from some locals. It was off the main road, free of tourists, historical, and beautiful. With each highlight I post, I remember something else we did that I want to write about, so I’ll finish with a few photos, and I’ll be back to tell you about one of my favorite days on the island in a later blog post (monk baths, an abandoned resort, and a spooky, slimy predator are involved). Thanks, friends, for giving me one of the best times I’ve ever had on an island. Or anywhere, for that matter. So much love. All in all, it was a successful vacation. In a place like the Caribbean, I’d get bored if I was just being lazy on the beach for a whole week. This trip was the perfect blend of adventure and relaxation. If you go, I recommend renting a Jeep. It’s not too expensive, and the roads would be nearly impossible to conquer in a less durable vehicle.